If you have a model of a human skull we strongly recommend making sketches of it from different angles. 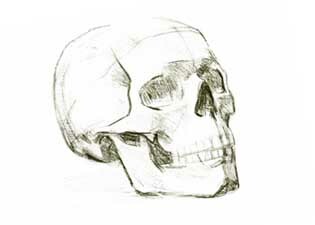 This step is important in understanding the human skull and helpful in drawing the human head. 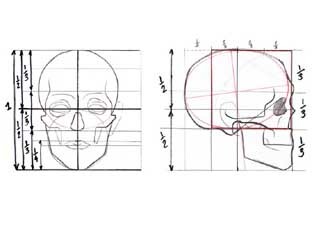 Make sure the proportions of the head are correct in relation to the angle from which you are drawing. When drawing from strange angles, the usual front and side proportions of the head don’t apply, so you have to look at the model and measure the proportions. 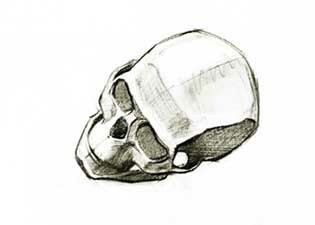 Sketch of a human skull, top view. 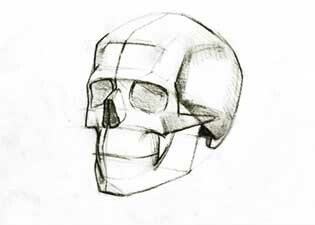 Sketch of a human skull, 3/4 view. Quick sketch of a human skull. 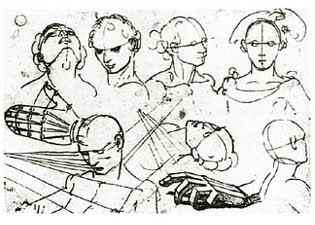 Head sketches by Hans Holbein.